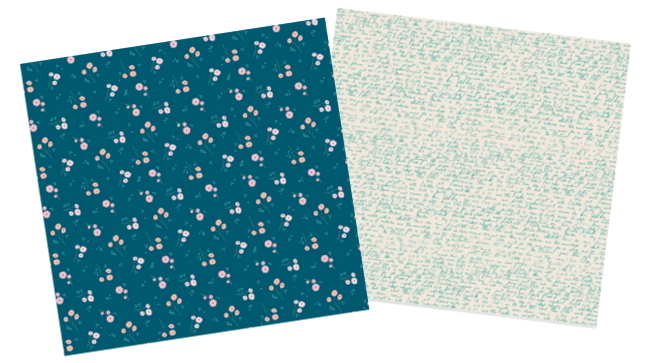 Deena Rutter’s new fabric line for Riley Blake Designs, Ava Rose, is exactly what I’ve been looking for! Deena asked me to join in the blog tour for her new collection, and I knew right away what I wanted to sew. 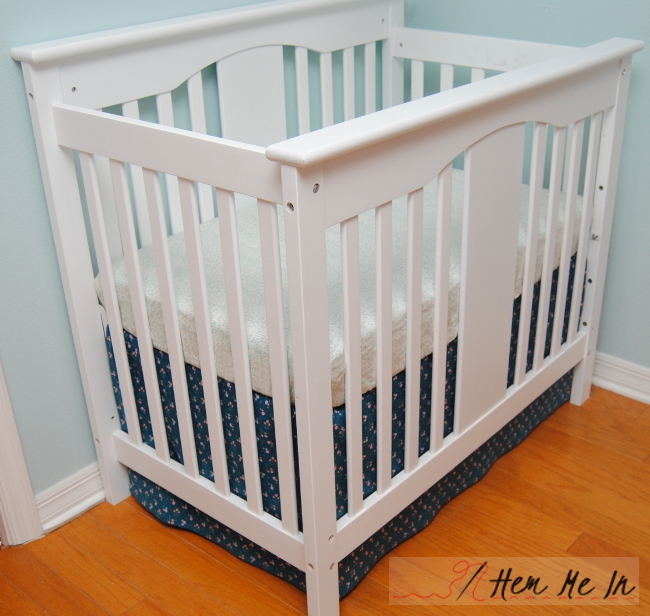 Our youngest daughter has special needs, and because we have a two-story house, we keep a mini-crib downstairs for her. The corner where it just happens to fit perfectly just happens to be in my studio. This little crib has been a little boring and in need of some dressing up. 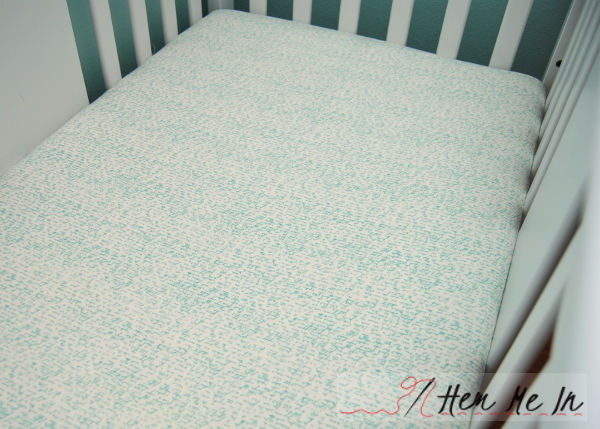 I picked Flower in blue and Script in teal for a crib sheet and bedskirt. This bedskirt turned out perfectly, and I love that it gives me a place to hide stuff! Since you only see two sides of the crib, I only made two sides. I measured the length of the side and then measured to find the height that I needed for the bedskirt to fall just above the floor. I cut the length 2″ longer and hemmed each side by folding in 1/2″, then 1/2″ again before stitching. I cut the height about 4″ longer so that I would have some adjust-ability. I hemmed the bottom edge by folding in 1/2″, then 1/2″ again before stitching. I serged the top edge since it’s just tucked under the mattress. Rather than attaching the finished pieces together, I used gaffer’s tape to tape them in place under the mattress. 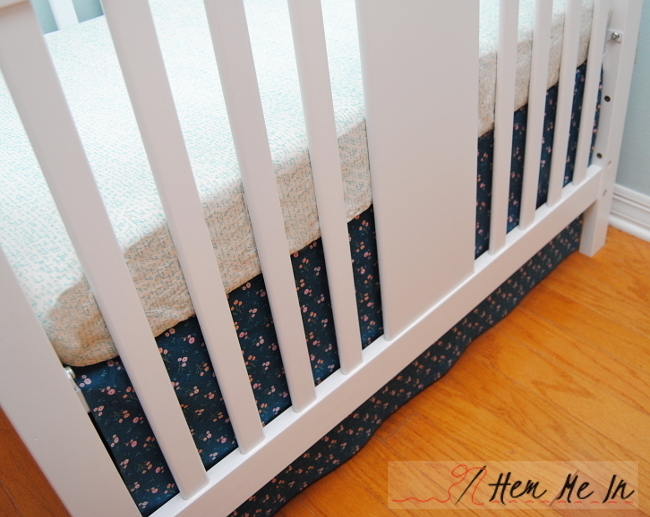 This way, I can adjust the skirt up or down when we change the mattress height. 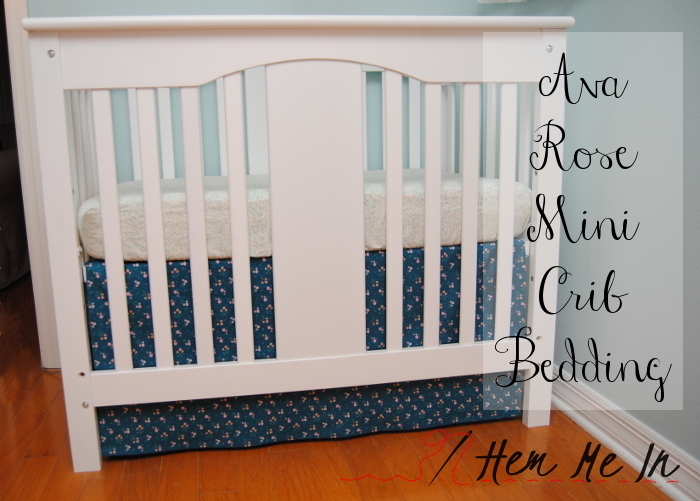 I followed this tutorial to make the crib sheet. Thank you so much for letting me sew with your new fabric, Deena! I love how this set turned out! Friday, May 5 Erin Cox, Why Not Sew?